A collection of tutorials and "walkthrough" guides are provided with Qt to help new users get started with Qt development. These documents cover a range of topics, from basic use of widgets to step-by-step tutorials that show how an application is put together. 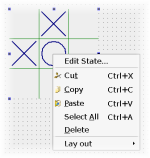 A beginner's guide to getting started with widgets and layouts to create GUI applications. A seven part guide to creating a fully-functioning address book application. This tutorial is also available with French explanation. A quick guide through Qt Designer showing the basic steps to create a form with this interactive tool. A guided tour through the translations process, explaining the tools provided for developers, translators and release managers. This tutorial gives a short introduction to how to use some of the features of Qt's unit-testing framework, QTestLib. It is divided into four chapters. This tutorial teaches you how to use qmake. We recommend that you read the qmake user guide after completing this tutorial.